This is a Mass Effect Andromeda Armor Guide. Here you will learn all about the various suits and armors found in Mass Effect Andromeda. Andromeda is a very treacherous place. Apart from the cold, dark, vacuum of space, alien species wait for you at every turn. Some might not be as friendly. With this in mind, Mass Effect Andromeda boasts a massive amount of badass armor for you to wear to brave the strange, new, worlds in the Heleus Cluster. There are four categories of Armor: Helmet, Armor (Chest), Arms, Leg. Fusion Mods are strange Remnant tech that is not clearly understood. However, you can fuse them with your armor for devastating effect. 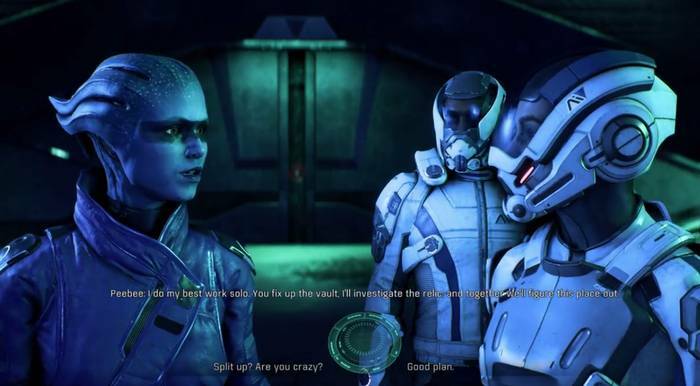 Pictured: Peebee, Liam and Ryder conversing. Ryder is wearing an Initiative Outfit. Great website you have here but I was wondering if you knew of any message boards that cover the same topics talked about here? I’d really like to be a part of group where I can get feed-back from other experienced people that share the same interest. If you have any recommendations, please let me know. Thanks! Got a timeframe for when levels 6-10 will be added to the lists? Thanks for pointing that out! We’ve fixed the link already.